STROMNESS, SCOTLAND (June 20, 2015) — After our last sessions of talks in the 2015 Larwood Symposium, we had a guided tour of some spectacular Neolithic sites on the island of Mainland in Orkney. (I know, an island called Mainland. That’s why I linked it.) 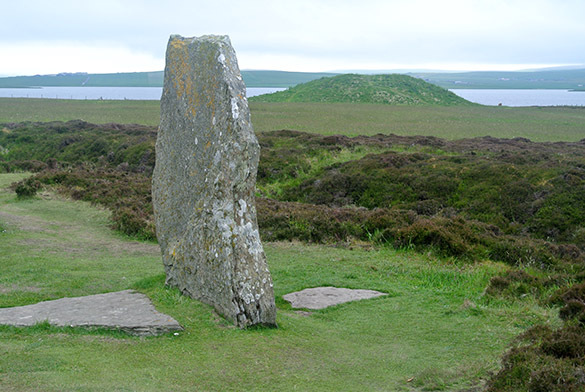 Above is a standing stone from the Ring of Brodgar, a stone circle just a few miles from Stromness. 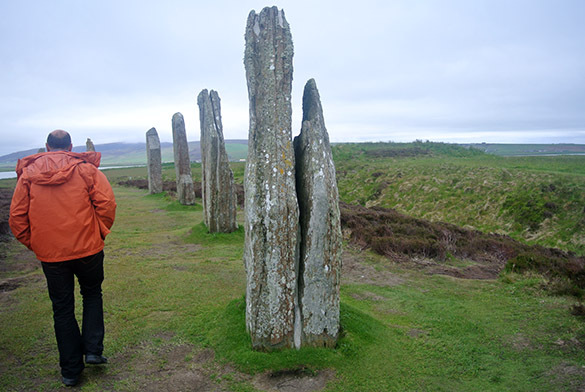 It is part of a World Heritage Site and is very dramatic (especially with a stiff wind off the North Atlantic). Here is a side view of the stones, with Paul Taylor for scale. They are made of the ubiquitous Old Red Sandstone. 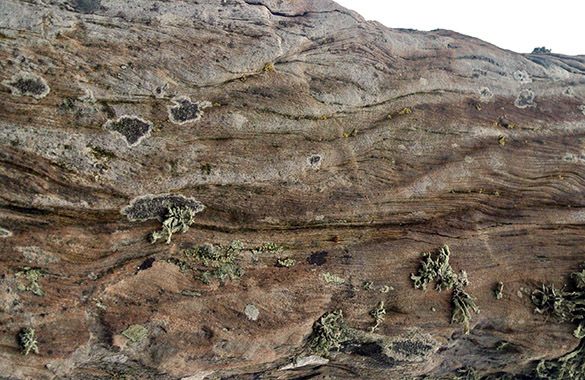 Note that when you stand such stones with their bedding vertical like this, the rain works its way between the layers, causing it to split and exfoliate over time. Of course, considering that these stones were erected between 2500 BCE and 2000 BCE, they’re in pretty good shape! A geology moment: This is a side view of one of the Old Red Sandstones, which I’ve rotated horizontal (the image, not the stone!). You can see beautiful climbing ripple laminae. 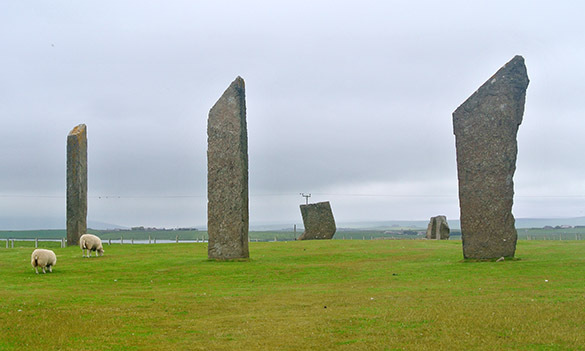 The Standing Stones of Stenness may be the oldest such Neolithic structure in Britain. For me it was the most evocative of this ancient and mysterious activity, even if it is the most manicured ring. 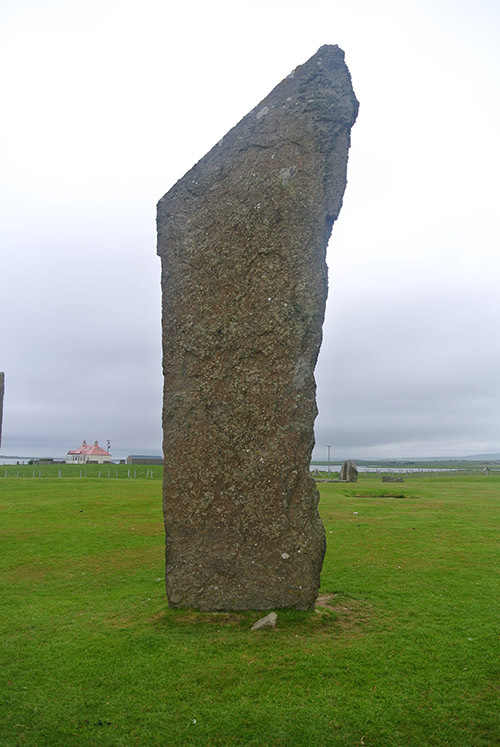 This Stenness stone is one of the most photographed rocks in Orkney. Maes Howe is a Neolithic chambered cairn, possibly built about 2800 BCE. 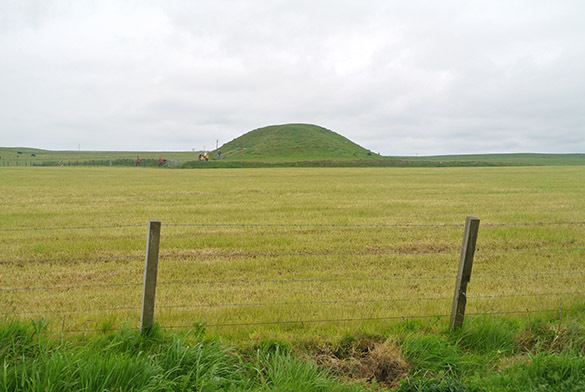 We see here a simple mound across a flat field. The interior is a complex main room with side passages and interior standing stones. This was likely a grave site, but no bones have been discovered in it. I wish I could show you the interior, but photography was not allowed. Our party, along with many others, crowded into the chamber after passing through the long and narrow entrance tunnel. Our guide was particularly good at telling the stories of the site and pointing out various archaeological features. On many of the stones are delightful examples of much later Viking runic inscriptions (ancient vandalism, really!). 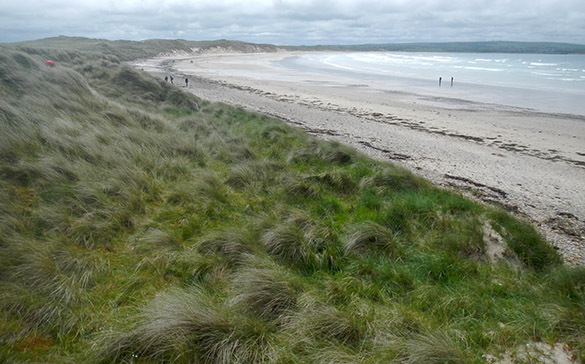 The Orkney coastlines have many partially stabilized beach dunes, like these grass-covered examples. Storms, though, can quickly erode them and move vast quantities of sand. 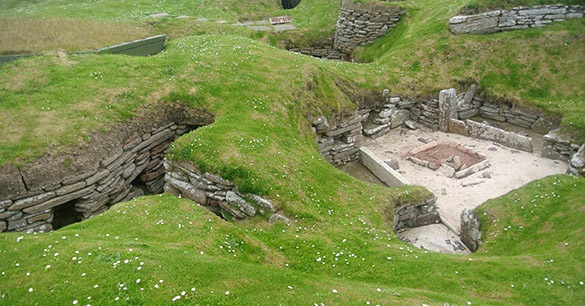 Such events have uncovered buried archaeological sites on the shorelines, such as Skara Brae below. 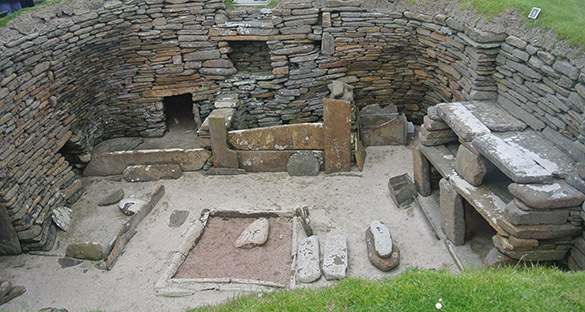 Skara Brae is a Neolithic village that was buried for many centuries under such sand dunes. It is now one of the best known archaeological sites in Britain. The sand and sod has been removed from the top of a network of homes and pathways, giving the immediate appearance of World War I trenches. This is one of the homes. It is preserved in remarkably good shape, with all the stone furnishings still in place. There are many mysterious objects associated with the Skara Brae site, including this fist-sized elaborately carved stone. Any ideas as to its function? 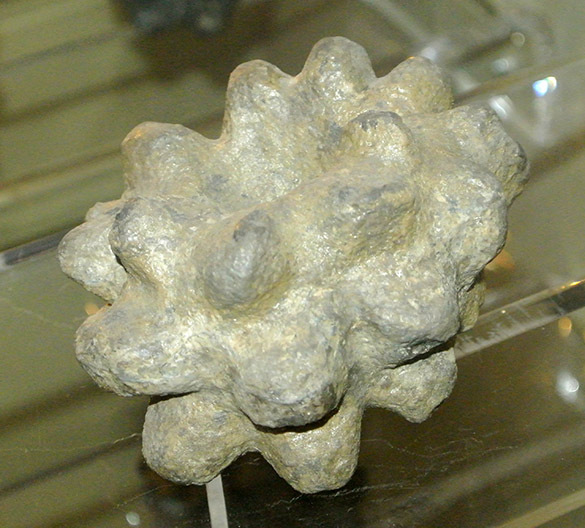 Paul Taylor thinks stones like this may have been used for hunting, tied together as bolas. Just because I find it interesting, here is a banner displayed in the local Laird of Skaill home near Skara Brae, which is open for tours. 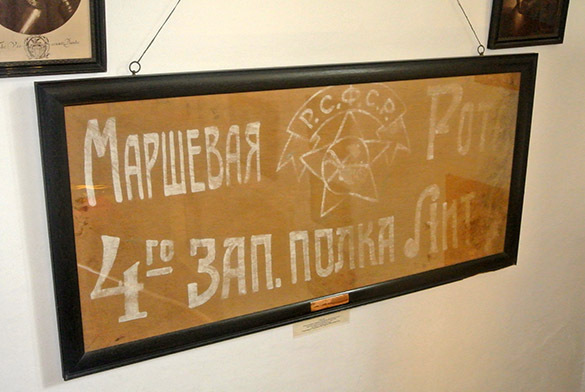 It is a Bolshevik souvenir captured by one of this blue-blooded family during the North Russia Intervention in Murmansk during the Russian Civil War. History, like geology, is everywhere — and delightfully unpredictable. 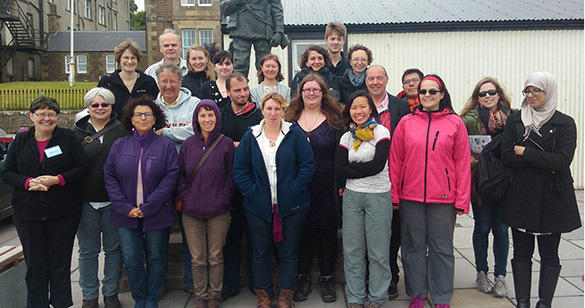 Finally, here is a group picture of our 2015 Larwood Symposium participants in Stromness. A most congenial and fun group! Thank you very much to Joanne Porter and Jen Loxton for organizing such a spectacular meeting.